The accident took place at around 1:30 p.m. on Friday near Mile Marker 1 on Interstate 10. The cause of the accident remains a mystery but it is believed that the driver may have momentarily blacked out while behind the wheel. However, authorities are still trying to piece together exactly what happened. What is known is that the bus careened off the interstate before hitting a sign and a tree. The two-dozen passengers who received medical attention were released after being treated for their injuries. In 2017, there were 4,889 large trucks and buses involved in fatal crashes, which is a 9-percent increase from 2016. There was a 40 percent increase in fatal crashes involving large trucks or buses between 2009 and 2017. On average, between 2007 to 2017, intercity buses accounted for 13 percent of all buses involved in fatal crashes, while school buses and transit buses accounted for 40 percent and 35 percent, respectively. In 2018, there were 183 school bus accidents, 39 accidents involving buses with seats for 9 to 15 occupants, and 97 accidents involving buses with seats for 16 occupants or more. In 2018, there were 319 injuries suffered as a result of large bus crashes. Of the 319 injuries sustained, 247 were injuries that occurred inside the bus. Being involved in a bus accident can be a traumatic experience made even more difficult if you have been injured. 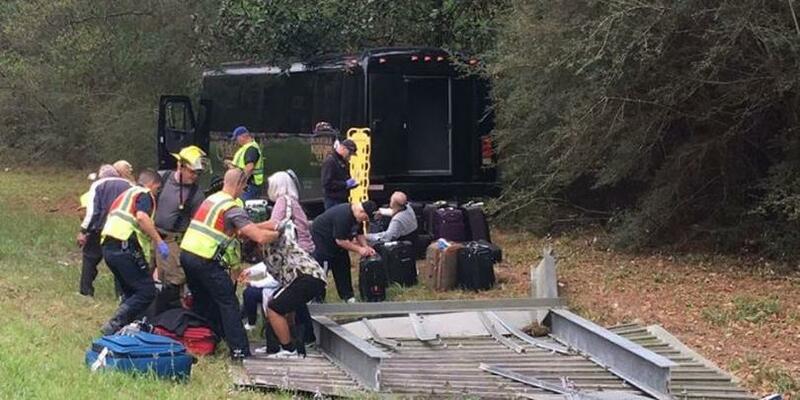 If you or a loved one has suffered a catastrophic injury as a result of a bus accident caused by someone else’s negligence, your Louisiana bus accident attorneys at Cardone Law Firm are ready to defend your rights. Following any sort of motor vehicle accident, it is important to seek out medical attention. As the recovery process begins for the individuals and families who have suffered an injury, many are likely to begin looking towards legal remedies to help them pay for their medical fees and other costs. The liable (at-fault) party can vary depending on the specifics of the accident. It’s worth noting that these types of accidents can be the result of one single party or multiple parties. At Cardone Law Firm, our bus accident attorneys have the ability to gather all the necessary information and obtain expert opinions from a supporting team of medical doctors, engineers, investigators, accident research specialists, and other legal professionals to uncover who is liable for the injuries you have suffered. Our Louisiana bus accident attorneys will provide you with the best legal guidance to ensure you are making the right decisions and obtain all possible compensation for your injuries. It’s time that your voice gets heard. The trustworthy and successful team of Cardone Law Firm are ready to help you obtain the compensation you need to begin recovery. Contact us today at 1-888-89-CARDONE.